Synthesis and Structure of PAEs. Organometallic PAEs. Supramolecular Organization of Foldable Phenylene Ethynylene Oligomers. 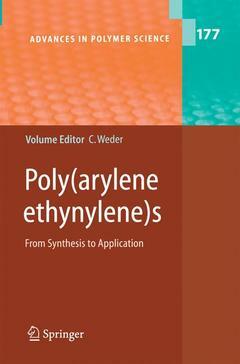 Poly(arylene ethynylene)s in Chemosensing and Biosensing. PAEs with Heteroaromatic Rings. Electronic Properties of PAEs. ..."When considering conjugated polymers, one typically first thinks of poly(phenylene vinylene) or polythiophene (PPV and PT, respectively). These materilas have been the focus of much scientific research, because of their history in the area of polymer light-emitting devices (PPV) and in organic semiconductors (PT)."..." This book provides a highly useful snapshot view of the field of PPEs as it stands today. It should serve as an excellent resource for active researchers as well as for beginning students interested in learning more about conjugated polymers and PPEs in particular. "...from: J.Am.Chem.Soc. Vol. 128, No. 5, 2006, p. 1773.